Bilstein's B6 Heavy-Duty shock absorbers will give you more control and better handling without having to lower your car or destroy your ride. If you want less bodyroll and more precise handling these Bilstein performance shocks for the 528i, 535i, and 550i will deliver without compromise. 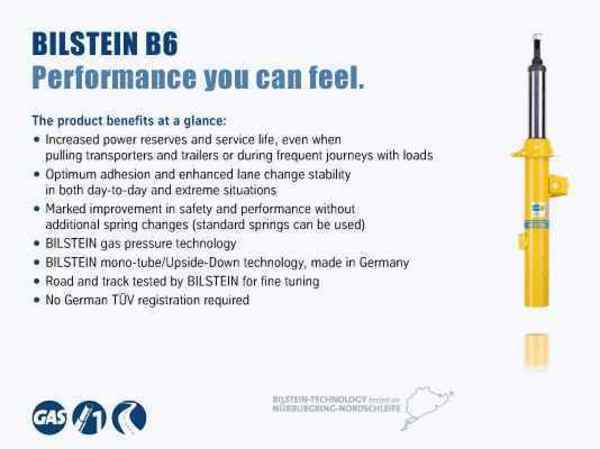 Bilstein uses a unique and patented valving system to stiffen the shock while still providing stock levels of ride comfort. The stiffer shocks will control body motions better than the original BMW shock absorbers which means less brake dive, body roll in corners, and squat under acceleration. These are the perfect handling improvement on the F10 without resorting to springs or coil overs. Bilstein shocks come with a limited lifetime warranty and install with all of the stock mounting pieces for a seamless shock replacement. These shocks are for the standard suspension only. For replacement shocks for the BMW sport package, see the Bilstein Sport shocks below. Not for cars with EDC electronically adjustable shocks unless EDC has been properly removed from the vehicle.